Porsche has announced a track-focussed 385PS version of the mid-engine Cayman sports car. The car debuted at the Geneva Motor Show and customers can place an order now for £64,451 - though numbers are limited. The Cayman GT4 is powered by a 3.8-litre flat-six engine with peak power of 385PS, linked to a six-speed manual transmission as standard, with no PDK option available. Acceleration from 0-62mph takes 4.4 seconds and top speed is 183mph. 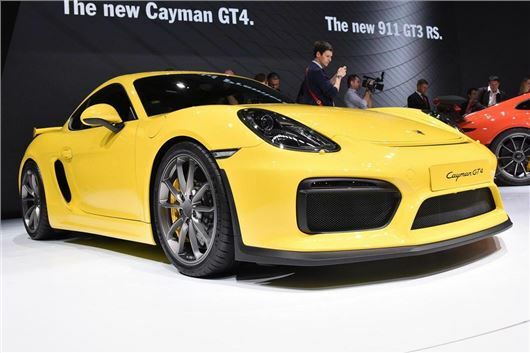 Economy isn’t the forte of the Cayman GT4, which as an official figure of 27.4mpg and emissions of 238g/km. The GT4 has a greater focus on track driving than other Caymans, so gets 30mm lower suspensiom, a stronger brake system and a limited slip differential, as well as a fixed rear wing and inlets in the nose to increase downforce. Standard equipment includes xenon headlights, a sports exhaust, Sports Chrono Pack, leather and Alcantara interior upholstery and 20-inch alloy wheels. Options include ceramic brakes and shell-backed seats.